This is the only optional video available for the Bond knitting machines. A regular instructional video comes packed with each Ultimate Sweater Machine, but is not available separately. Learn how to make your first sweater from start to finish with the Making Your First Sweater VHS video. 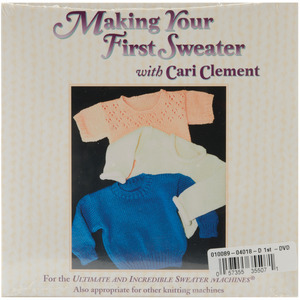 Join Sweater Machine teacher, Cari Clement, as she guides you through making your first sweater. You will learn everything you need for making this and many more personally created garments. You can make any size sweater by selecting one of the many sizes in the multi-sized printed pattern that comes with the video. As a bonus, the video also gives you special hints and tips for especially easy knitting—from the pros who've been knitting on the Sweater Machine for years.